The Medieval Times encompass one of the most exciting periods in the History of England and Europe. The names of many famous Medieval people scatter the Medieval History books and other historical documents. Why were these important Medieval people famous and what did they accomplish? 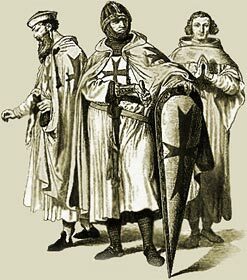 Famous Medieval people of the Middle Ages included Artists, Clerics, Crusaders, Explorers, Religious Leaders, Military Leaders, Philosophers & Theologians, Scientists, Physicians, Writers & Poets and Reformers who featured in the Medieval times of the Middle Ages from 1066 - 1485. The following biography, short history and interesting facts provide helpful information for history courses and history coursework about the key dates and events in the life of Vlad Dracula who was famous as the Medieval prince who murdered tens of thousands of people in Transylvania by impalement. He is believed to be buried at a monastery located at Snagov, near Bucharest. Why Vlad Dracula was famous: As the sadistic prince of Transylvania who murdered over 40,000 people by impalement. The story and biography of Vlad Dracula which contains interesting information, facts & the history about the life of this Medieval person of historical fame. the Medieval times were extremely blood thirsty. The terrible forms of execution and Medieval torture were commonplace. But the atrocities of Vlad Dracula were some of the most infamous. Vlad Dracula was cruel and totally merciless, without doubt he was a sadist. Even when he was imprisoned his lust for blood continued - he captured and tortured birds. The very number of his victims made him infamous as one of the cruellest of all princes. He had more than 40,000 people impaled in a period of two years in Transylvania. The torture and execution by impalement were terrible. Vlad the Impaler enjoyed witnessing such events. Men, women and even babies were murdered by impalement. Interesting facts and information with a short biography about the Medieval Life, Times and history of Vlad Dracula. Additional useful details, facts, history, biography, timeline and information about the lives of other famous people of the Dark Ages and Middle Ages, and the important events which occurred during their times, can be accessed via the Medieval Life and Times Sitemap. The content of this article on Medieval life and times provides free educational details, facts and information for reference and research for schools, colleges and homework for history courses and history coursework.